More than a year later, in neighbouring Ecuador, she visited the ‘middle of the world’: the astronomical observatory and mountain called Catequilla, exactly on the equator (around 800 AD). 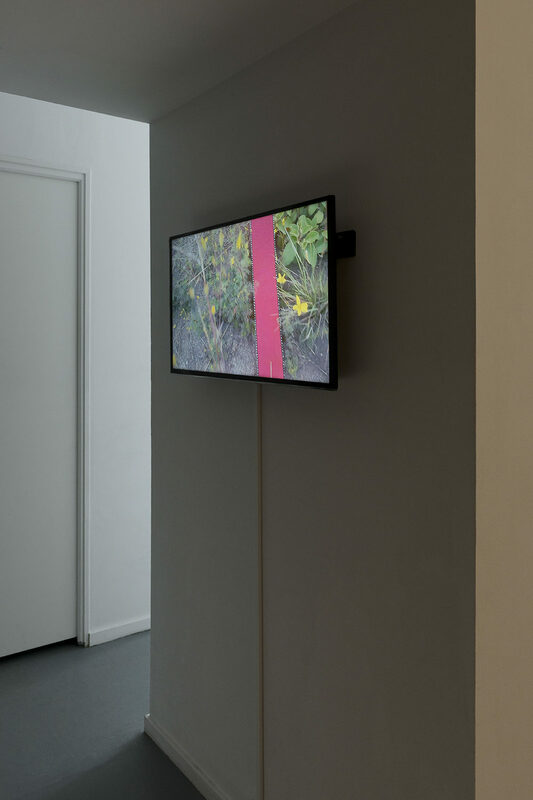 Van der Putten’s intervention there is documented in the video ‘Como un Caracol’ (‘As a snail’). 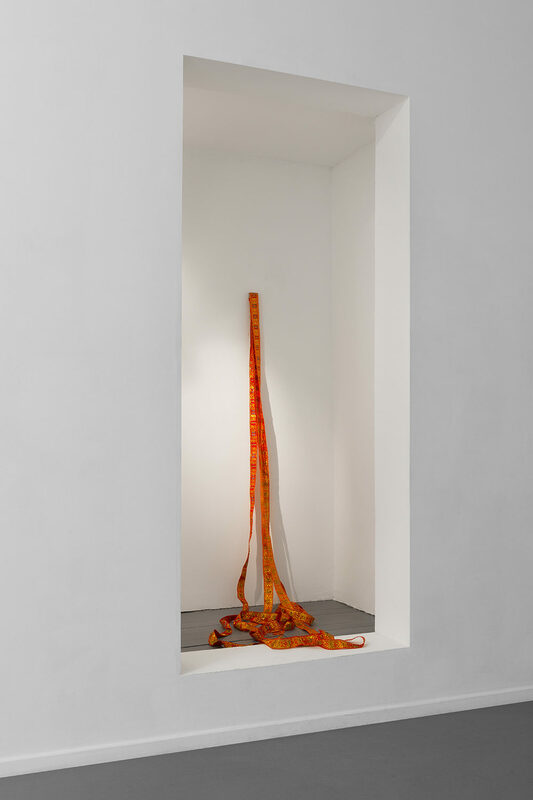 In the passage to the southern gallery one can see how a red woven belt is dragged along the middle line of the earth, as if it represents a connection with the entire circumference of the world. Silently, only the wind can be heard. This work is the starting point for the exhibition. 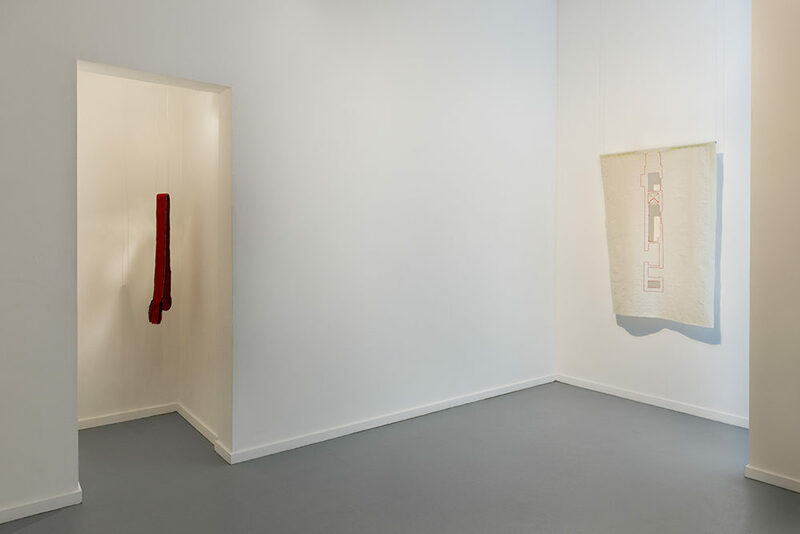 The exhibition title Quitsa refers to this location, and to the old term ‘Quitsato’: ‘Quitsa’ (Middle) and ‘To’ (World). 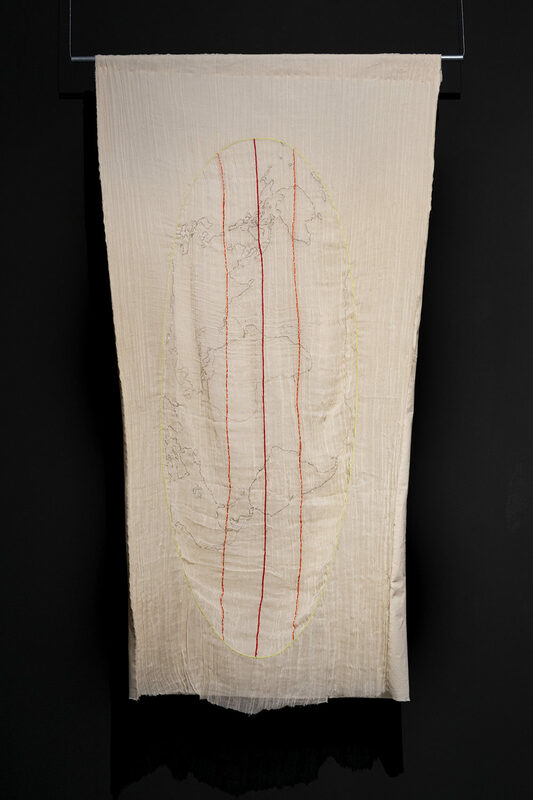 The importance of Catequilla as a unique point on the equator, in relation to the cyclical time measurement of the sun-earth rotations and the stars, inspired to show a different view of the world map – the equator as the central vertical line and the East on top. This is a representation of the atlas as proposed by Cristóbal Cobo and his geoastronomical research team, also called Quitsato. 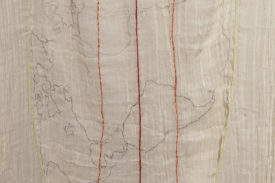 In the southern gallery room, this map is shown on hand-embroidered textiles. 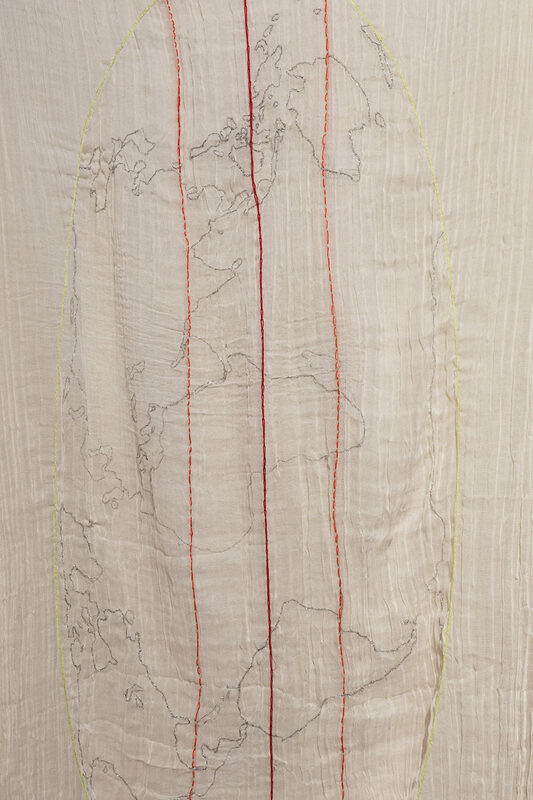 The opposite work, the garment ‘Trait d’Union 2’, is a reflection of this world map. 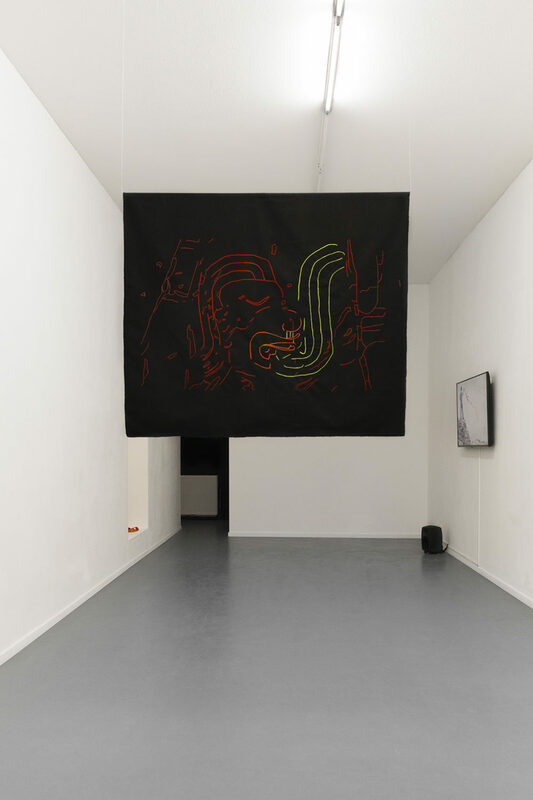 It’s based on the floor plan of the gallery with the façade on the East side, and the wall between the North and the South gallery as the equator. 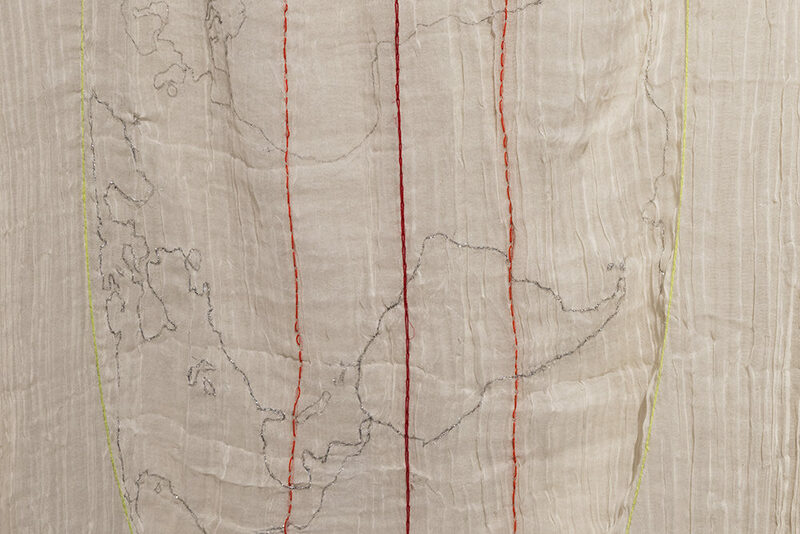 In the opening performance, Janneke van der Putten dresses in this textile and thus identifies herself with the place where her work is shown. From that base her voice sounds and merges with the gallery spaces. 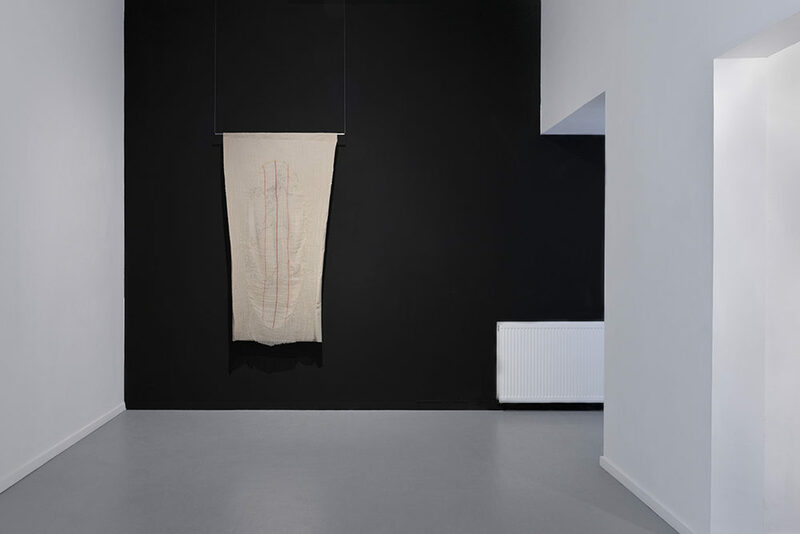 All these elements come together in the hanging black canvas ‘And The Voice Became Space’*, on which the head of a human sacrifice is embroidered in silhouette. This image originates from a series of reliefs carved in granite at the archaeological site of Sechin (ca. 1500 BC) in northern Peru, located in the same valley as Chanquillo. 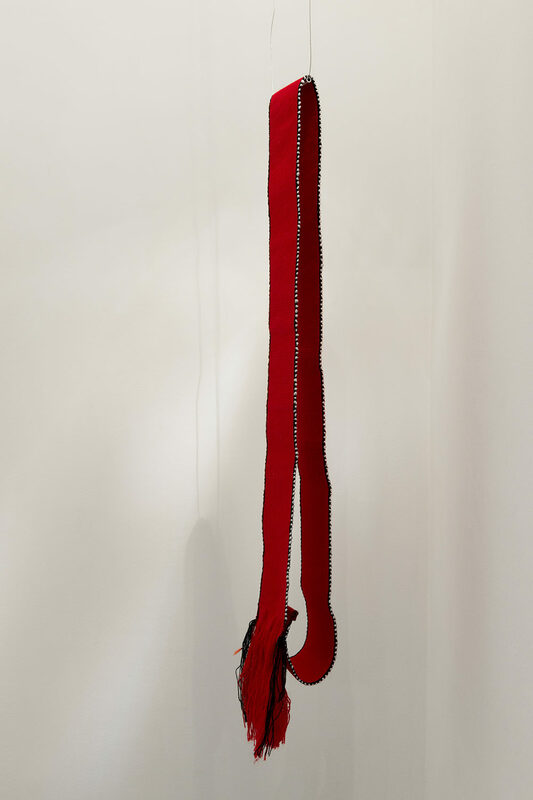 Blood flows from the mouth, but according to the Peruvian artist Christian Galarreta it could also represent the voice. Indeed, a bundle of lines rises like a stream of air: breath converted into sound and language – energy based in ancient cultivated land. 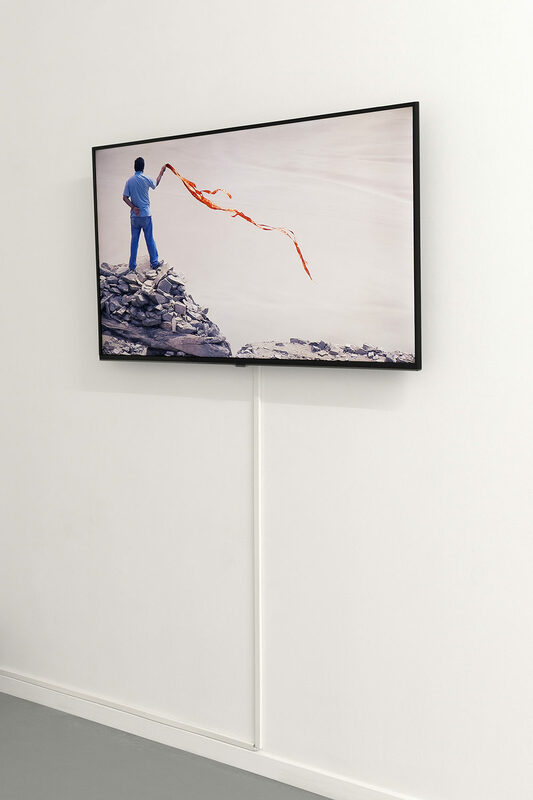 * The work ‘And The Voice Became Space’ is based on the concept and same entitled work by Peruvian composer and artist Christian Galarreta (link). 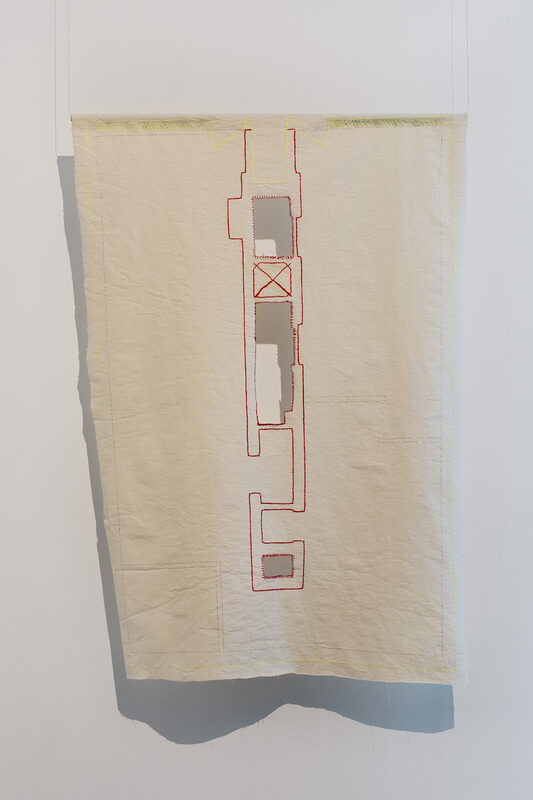 > Thanks to artist Daniel Pico for the collaboration in the work ‘Como un Caracol’ (2016).